As already reported in BTN (See issue 27 April) the nine-month established French airline flies initially three times a week, its aircraft offering 74 ‘lie flat’ seats whilst Delta is straight away daily with eight twin modules (16 seats) in Delta One also able to go flat, with very easily used 16” video monitors, integrated USB and power plugs (including UK three-pin). La Compagnie is promoted having hand held tablet style TV units. At the back of the Delta aircraft are 44 3+3 Delta ‘Comfort’ seats where you get 35” seat pitch, more recline, and upgraded beverage supply. The 108-seat main cabin offers a minimum 31” pitch, the same vast IFE offering and like ‘Comfort’ 9” seat-back monitors. The blue wi-fi signs glare tantalisingly at you in whatever class you are in, but sadly the GoGo system only works once the aircraft gets into Canadian airspace. This report is not a comparison of La Compagnie and Delta. 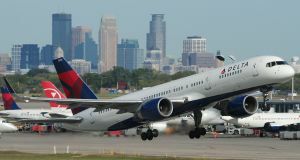 We can only tell you what Delta has to offer, suffice to say that the aircraft are not new (ex-TWA, an airline more senior people might recall that folded into American Airlines back in December 2001) the last 757 built in 2004, but many still in service, the Rolls-Royce RB211 powered machines ideal for thin, or introductory routes. Delta has a fleet of 17 of this type of aircraft, this example in pristine condition. One would never know it was probably 25 years old. The new Heathrow – Philadelphia route operates in competition with American Airlines established US Airways service, also a 757 and British Airways with a 777. Where Delta does really score is the use of T4, in this writer's opinion, the best terminal at Heathrow with very easy car access, everything at one level, not very busy, the building itself completely refurbished. There are over 30 shops, eight eating places and seven airline lounges, Plaza Premium the latest arrival. By train there is a shuttle every 15 minutes to the central area, timed to connect with the Heathrow Express and also the Piccadilly Line, again about every 15 minutes taking 52 minutes to Piccadilly. It is not like the main Tube services. You have to be patient. Delta uses the very quiet Skyteam lounge, much superior to what is currently on offer at Luton, and there is no chance of getting wet, an airbridge provided. Heathrow is air bridges. With any narrow bodied aircraft the Business Class section has its limitations. With 2+2 the window seat occupant has to climb over whoever occupies the aisle position. 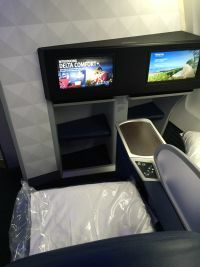 Delta have tried to get over this problem by slightly angling the seats, and this works to some extent, but it does not compare with the provision on the carrier's 777 fleet used on the major North Atlantic services. Delta One (previously to come upDelta Elite) has its limitations, but the 16-seat cabin is a homely affair, the staff diligent, always available, and quick with whatever is needed through the flight. You don’t get the storage space of the bigger aircraft, but the foldaway table offers a sturdy dining or working table. The dining is excellent, perhaps not as flamboyant as with the Gulf carriers, but with a good selection, nicely served, and with the small cabin anything wanted quickly obtained. Smoked salmon and grilled shrimp with caper onion relish and creamy cocktail sauce. If you prefer more time to work, sleep or simply relax, it was easy to select one of the main event entrées served with an appetizer, salad, fruit and cheese, and dessert. There was freshly brewed Starbucks coffee or Starbucks VIA ready brew decaf on offer but I preferred the Quinta De La Rosa Port. Unlike some carriers Delta offers a proper sandwich selection prior to arrival the grilled salmon, pita chips and fresh fruit perfect to round off a fine flight. Airline boss Richard Anderson is concerned about competition with the Gulf carriers. If his 777s are as good as the 757 he has nothing to fear in terms of what is on offer to his business class customers.